Ready to break in that new glove or mitt but don't want to spend weeks or months waiting? The Mizuno Glove Steamer is the answer! The Mizuno Glove Steamer breaks in new ball gloves by steaming and softening the leather. Once the glove is removed from the steamer, a Bases Loaded associate will shape and soften the glove with a wooden mallet that simulates catching a ball. The professional shaping and steaming process will shorten the break-in period of your glove getting you game ready faster! Laces getting old, cracking and breaking apart? Have an old glove or mitt you're not ready to replace yet? Bases Loaded can relace it for you. 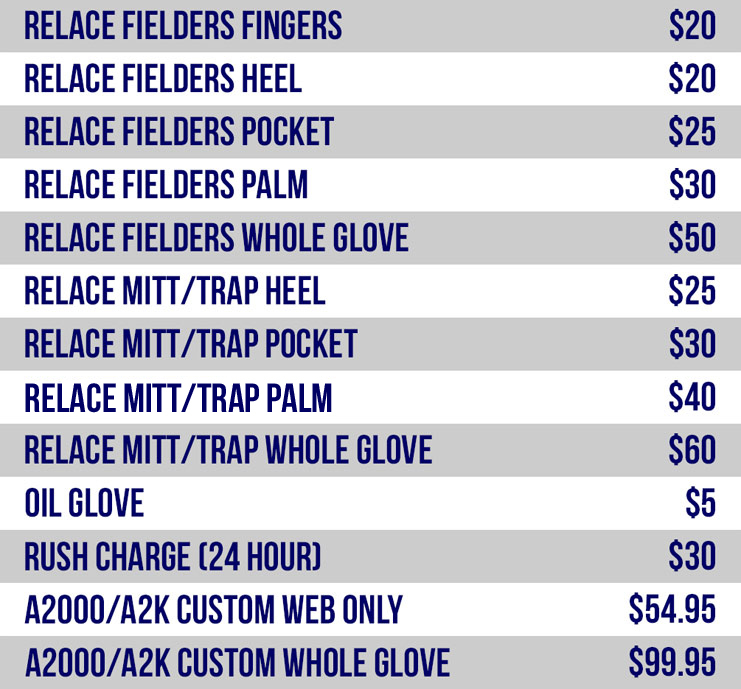 Below is a list of the different options available to get that glove or mitt back to playing condition. We give you a range of options from relacing a small part of your glove or mitt to relacing the whole glove or mitt. Bases Loaded has provided hundreds of thousands of team members uniforms & equipment over the past 20 years. In the last 20 years, Bases Loaded outfitted over 100,000 team members with uniforms. Don't leave your uniforms to just anybody. Go with the pros that focus solely on Baseball Uniforms and Softball Uniforms. Bases Loaded specializes in Little League Baseball Uniforms, Girls Softball Uniforms, Youth Travel Baseball Uniforms, Competitive Fastpitch Softball Uniforms, Adult Baseball Uniforms, Adult Softball Uniforms, and All-Star Uniforms. Whether you are looking to outfit a team, club or league. Bases Loaded is your uniform source. We can provide you with individual pieces such as custom hats, custom uniforms, or entire packages including everything from hats, jerseys, pants, belts, socks, undershirt, jackets, hoodies, team cleats, even team sunglasses! You won't find anyone in town that can outfit your team the way Bases Loaded can from top to bottom! To find out more about our Baseball Uniforms and Softball Uniforms CLICK HERE!! !